Epitomising de GRISOGONO’s creativity, the Tondo Tourbillon Gioiello swathes its new mechanical movement – an off-centre tourbillon at 8 o’clock – in an abundance of sparkling white diamonds. This marks the first time de GRISOGONO has created a tourbillon specifically for women. 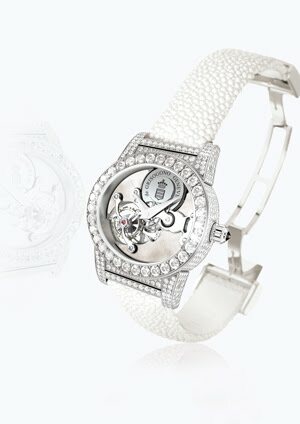 The Tondo Tourbillon Gioiello is the first in a watch trilogy comprising of white, black and brown diamond designs. This exquisite time-keeper, with its luminous mother of pearl, its white diamonds, the sophisticated and elegant curves of its bridges and its daring design, reflects de GRISOGONO’s contemporary baroque design aesthetic at its purest. A marriage of technical excellence and jewellery art. By draping its first watch to house an off-centre tourbillon, in full set white diamonds, de GRISOGONO draws attention to an inherent contrast contained within the design – that between the ultimate in high horology and the ultimate in high jewellery. The Tondo Tourbillon Gioiello’s precise and undulating curves and brilliant whiteness are testimony to de GRISOGONO’s constantly growing mastery of the art of measuring time. The Tondo Tourbillon Gioiello bears an XL white gold case, unusual for its oval shape. The watch is also waterproof to 30 metres and has a 72 hour power reserve. With 10 carats of white diamonds, including 33 generously-sized stones lining the full length of the watch from the sides all the way up to the lugs, the watch radiates an exceptional brilliance. The effect is even more intense thanks to a setting method, ‘à quatre grains’, which conceals the metal under the diamonds from view. In a tribute to black diamonds, a symbol of the success of de GRISOGONO, a deep black diamond adorns the watch crown. The strap, in white galuchat, another de GRISOGONO signature, gives the final touch to this glittering timepiece. At the heart of the watch beats the first manual winding mechanical tourbillon movement ever to be signed by de GRISOGONO. What sets the Tondo Tourbillon Gioiello apart, is the novel position of the tourbillon cage at 8 o’clock, toying with asymettry while drawing the eye to the mother of pearl dial. The Tondo Tourbillon Gioiello calibre will impress connoisseurs - its components are polished and shaped by hand and the processes all comply with industry expectations of horological finishes. On the calibre’s underside are the delicate engraving of the Cote de Geneve, while the brand name and coat of arms are engraved on the ratchet wheel of the cylinder. Polished and encrusted with diamonds, the dauphine hands are white gold. The daring architecture of the Tondo Tourbillon Gioiello alongside its exclusive calibre once again succeeds in evoking the vivid creativity of de GRISOGONO.